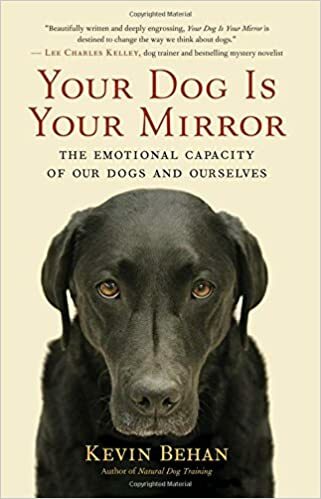 At the NDT conference I often referred to the concept of “emotional momentum.” For example I mentioned that Pushing teaches the dog he can transfer emotional momentum to the owner, most especially his stress reserves, and conversely, Collecting teaches the dog he can absorb emotional momentum from others, most especially, even their stress reserves. The notion of emotional momentum is one reason I am a critic of modern learning theory which holds that reinforcements are causal to learning, and Neo-Darwinism which holds that random variability between traits is causal to evolution. Neither of these take the phenomenon of emotional momentum into account. The first order of learning is addressing the matter of emotional momentum (emotion always travels from the predator to prey polarity, this is innate, a feature of consciousness that can not be affected by reinforcements or vary randomly between organisms) and thus the first traits through which any behavioral system can evolve are the predator and prey duality rather than a plethora of traits that vary randomly. 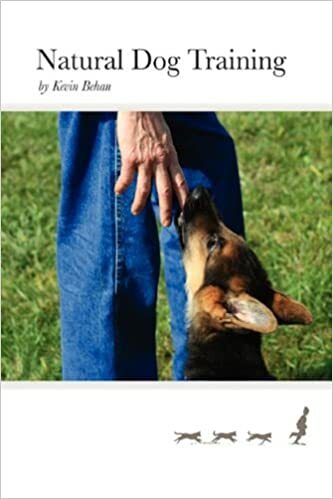 So below is a closer look at the dynamic of emotional momentum to both place it in a more familiar context of human behavior as well as emphasizing how the core exercises central to NDT help a dog deal with the problem of emotional momentum. All interactions, no matter the participants, the nature of their relationship or the overall context, at rock bottom represents an exchange of emotional momentum. When emotional momenta are sorted out, then physical actions follow coherently. This is why even high brain activity is nevertheless modulated by the motor circuitry. Momentum, motion, is the substrate of all activity be it physical or mental. So before an interaction can proceed first a direction of flow must be apprehended so that one party is going to transfer momentum and the other is going to absorb it. (This has to date been misinterpreted as dominance and submission in a linear hierarchy, and more recently as dominance and submission in a more limited sense of access to resources. In reality predator polarity is the projection of emotion, the preyful polarity is the absorption of emotion.) And so the central question of sociability is whether or not a given participant can absorb the other’s momentum. If the mechanics of transfer are not clearly delineated then flow can’t happen and survival instincts will take over. What do I mean “absorb momentum?” It’s exactly the same as being willing to listen to someone in a conversation. When someone speaks, a receptive listener nods their head, says “uh-huh” and gives other indications that they are listening, i.e. absorbing. The speaker has energy to give, a listener must absorb this momentum in both their body and their mind. On the other hand when someone is boring or noxious the listener closes down and no longer absorbs their momentum, or they might interject and project right back out of turn and so the conversation either overheats or shuts down altogether. Ideally however if each participant synchronizes when they project and then absorb, and to the respective capacities of the parties involved, then they are aligned along a common line of flow, i.e. keeping the conversation going. In this case there is a back-and-forth and an up-and-down style of conversing that can continue to elaborate to a higher and higher level of energization and which feels gratifying to both parties because they are equally participating in the construct of that wave. Why would one individual want to absorb another’s momentum? Because emotional momentum is energy and it feels good to be energized. Why does it feel good?—by which I mean–How does it feel good? It feels good when the absorption of momentum is experienced through the hunger circuitry. In other words, all emotional experiences of flow are supplied by the physical memory of ingesting food, most especially the warm fluid of mother’s milk coursing down the alimentary canal filling the void of natal hyper-hunger and thus calming the hyper-active nervous system that in the earliest phase of life has absolutely no capacity to deal with stress. This state of calmness, front end connected to hind end through the flow of energy, i.e. flow of nutrient (and then the physical memory of the flow of nutrient) is next correlated with smooth locomotive action as the developing organism masters the movements required in getting to things it wants, i.e. things it wants to put into its mouth. So the hunger circuitry is co-opted to continually render the sense of emotional grounding even in complex interactions. However, if absorbing momentum feels good why wouldn’t all individuals in all instances be willing to absorb momentum? (Actually, it’s not a matter of being willing, rather it’s a matter of capability. Animals are constantly trying to absorb momentum as when we see them licking their lips, which has to date been misconstrued as merely indicative of stress, or in calming signals theory as being a signal of appeasement, when what it most accurately indicates is the individual is trying to absorb momentum through the rekindling of the physical memory of ingestion.) An individual cannot absorb momentum when they go over their emotional capacity. So when over capacity and stimulated, which means they can’t feel their front end as being connected to the hind end, then this input is experienced as a raw rate of acceleration that falls outside the channel rather than as part of a strengthening wave pattern. For example, one could be driving along on a nice winter’s day, grooving to the music and then suddenly hit a patch of black ice whereupon the car’s wheels seem to literally kick out from underneath in an out-of-control skid. This spike of energy falls outside the smooth wave function of the car ride and is now experienced as a sheer rate of acceleration and which cannot be contained within one’s sense of their body. This sensation of rocketing out of the body overwhelms the hunger circuitry and the previous feeling of momentum (good); is transformed into the sensations of a too powerful acceleration (not good). Unlike a race car driver who has mastered integrating such spikes into a wave pattern, we reflexively act just like a dog when it is scared and seeks to grab something in its jaws: we grab the wheel. Race car drivers don’t do that. They stay loosey-goosey, i.e. their shoulders remain soft and flexible so the wheel can float through their hands and their hand can move from wheel to shift at lightening speed. Because of their high emotional capacity in terms of driving a race car at 220mph, race car drivers even when things go awry can still feel the car, the road, and the momenta of the other cars. They stay calm and can act coherently because unlike the rest of us who only have hundreds of thousands of hours learning how to drive a car up to 85mph, they can still feel what is happening around them because they are still in their body. The state of mind consumed with acceleration is mediated by the balance circuitry and so the subliminal beam of attention is now fixated on the inner ear canal. In this state the organism tries to push incoming input/momentum from their head (experienced as pressure). This is why dogs growl. (The core exercise of barking turns this incoherent state of mind into a coherent state of mind, it recapitulates the wave function and the feeling of locomotive flow. One can literally see the wave of the locomotive impulse convulse through the dog’s body and crystallize into a sneeze, burp, whine whimper or woof, and eventually a deep, metered bark.) A growling dog is pushing against the muscle tension in its clenched jaws in order to keep any more force of acceleration from entering its mind. Where do such sensations of acceleration come from in an interaction between two dogs when, unlike a car hitting a skid there is no actual physical force of acceleration acting on the individual’s body? These sensations of acceleration come from the physical memory of the powerful propulsive forces of the hind end when running after something the individual is attracted to. So when an individual is accelerated, and yet it doesn’t sense that the object of its attraction can absorb that force, this then triggers old pain memories as registered via the balance circuitry and the fear of falling and running face first into immovable objects. Note that when another driver violates the space around our car we too feel the physical memory of a violent interruption of momentum, even though in that precise instant there is not in fact an actual shift in acceleration. It’s simply perceived of as such through the power of physical memory. You may even find incoherent expressions issuing from your mouth as you “bite” the wheel. When individuals are able to respectively absorb the other’s momentum in a prescribed sequence, then the interaction proceeds smoothly and an emotional bond becomes possible as the individuals take turns transmitting and then absorbing what the other is putting out. Why would an individual want to give momentum? Because it feels good to go from a state of emotional pressure to a release from said pressure (a) when the interaction begins to bog down as in a lag in the conversation so that the parties can’t sustain a wave pattern, and (b) because the physical memory of flow guides the individual to give momentum in order to get momentum. It takes two to make a wave and it takes a powerful wave to resolve unresolved emotion, which is the universal driver to all animal behavior unlike learning theory which holds it to be seeking pleasure and avoiding pain; and unlike Neo-Darwinism theory which holds that it is to survive and to replicate genes. Yes I believe one can make that correlation. If the dog isn’t grounded (which paradoxically is synonymous in more complex interactions with weightlessness as when in resonance with another) then he’s experiencing a sheer rate of acceleration rather than a channeled momentum and reacts reflexively rather than spontaneously and becoming a counterbalance (generating a trait-on-demand).